Bethlehem University is working to support students and alumni as they shape their career paths and future livelihoods. The annual career day, held on Thursday 3 May 2018, brought potential employers together with students and graduates. Sponsored by the Arab Bank, more than 40 employers with around 70 job opportunities from the private, public, business, health, hospitality, and education sectors set up booths for students to visit, take materials, present their CVs, and be interviewed for possible employment. During his opening speech, Dr. Michael Sansour, Executive Vice President, welcomed the students and participants in this important day in which students come prepared to directly meet with employers. Dr. Sansour added that organizing such an event has become a tradition of Bethlehem University for 23 years now where the University helps seniors to achieve their goals and build their careers. He continued that this day provides a unique opportunity for students to communicate and get to know the institutions and companies in the local market. Speeches were also given by Ayman Dahadha, District Manager at the Arab Bank, Ruslan Abu Reyhan, from the Ministry of Labor, and alumnus Muhammad Mussa, National Insurance Company Branch Director. Dr. Mahmoud Hammad, Dean of Student Affairs, delivered the closing speech in which he thanked all those who worked to ensure the success of this day. Dr. Hammad called on the participating institutions and companies to give priority to human capital over the physical capital by employing as many graduates as possible, stressing that the real investment is in human resources. Saher Khair, Career Guidance Coordinator, said that the office of the Dean of Student Affairs has been preparing for this day for more than two months. He added that they organized special workshops to provide senior students with training in CV writing and job-interviewing techniques to help them better market themselves to potential employers. Bethlehem University organizes this annual day as a continuous step to its message here in Palestine. 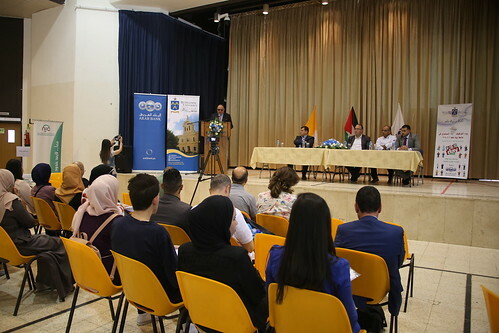 Education at Bethlehem University is unique because each and every day university life equips students with the skills they need to take their roles in the future.